How can we achieve this? I would suggest that we need to pay considerably more attention now to ensuring our young people are acquiring the right skills for the future – as far as we are able to predict those skills. I know one thing for sure – that having significant numbers of them unemployed is not good preparation for the future (742,000 16-24 year olds or 16.1 per cent, according to the ONS figures published on 17th April 2015). The overall unemployment rate is 5.6 per cent. I welcome the recent announcement that the Conservatives will fund a further 50,000 apprenticeships for 22-24 year olds who have been unemployed for six months or longer. I look forward to hearing that employers have taken up this challenge. One way to reduce youth unemployment, that has received attention from both the Coalition and the Labour party of late, is careers guidance. The Coalition have recently published the revised Careers Guidance and Inspiration in Schools, that is very welcome and is a positive move towards supporting schools through, for example, further support to build stronger connections with employers and clarifying the role of governors to ensure that independent career guidance is provided to young people. So I scanned through the document to gain an understanding of where the emphasis was in terms of what ‘must’ be done! The following table shows the ‘musts’ and ‘shoulds’ by heading. 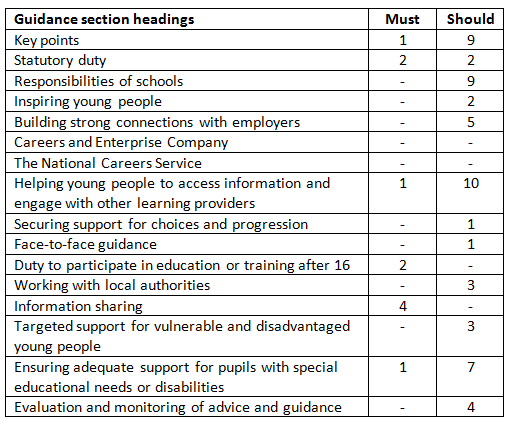 I found the distribution interesting – for example only one ‘must’ and 10 ‘shoulds’ in the section on ‘helping young people to access information and engage with other learning providers’. I would have thought that it was of paramount importance that the ‘best interests of the young person’ was the main driver of all career guidance. Otherwise it begs the question whose interests the guidance represents. I have also read Labour’s manifesto and agree with my colleague Ben Durbin’s observations. If the Labour party become the main political power I will watch with interest how they use their allocated £50 million and what their ‘partnerships between universities, schools, colleges and employers’ look like. (How employers are supported to provide the vast number of quality experiences of the world of work is another discussion.) Or, perhaps the entire £50 million will go to schools to enable them to carry out more face-to-face support for young people? If the Conservatives remain the dominant political power after 7th May I will wait with interest to see how the new Careers Company better supports schools. Whatever the outcome of the election, and whoever is in power after May 7th, perhaps it is time for some cross-party agreement on some fundamental requirements of career guidance. Let’s hope that this topic is raised at the forthcoming ‘Question Time Special’ on the election.